Hendrix Business Systems Hosts Grand Re-Opening and Ribbon Cutting Event Celebrating their newly Expanded Showroom & Lab in Uptown Charlotte | Industry Analysts, Inc.
January 30, 2018 – Charlotte, North Carolina – Hendrix Business Systems, Inc. (HBS), a North and South Carolina independent Canon and Xerox office equipment dealer, hosted a special Grand Re-Opening and Ribbon Cutting event with the Charlotte Chamber of Commerce, the American Heart Association of Charlotte and several partners and clients as their guests. This event celebrated the newly expanded Uptown Charlotte Showroom and Lab located in Founders Hall, 100 North Tryon Street. The showroom itself is now twice the square footage as it was when they first opened this location on March 31st, 2014. The newly expanded facility showcases the latest Multifunction Copiers, Large Format Printers, Office Printers, Document Management/Output Management Software Solutions and Production Systems from both Canon and Xerox. Additionally, a portion of the showroom is dedicated to ancillary products from MBM, Intec, Duplo and other manufacturers represented by Hendrix Business Systems. 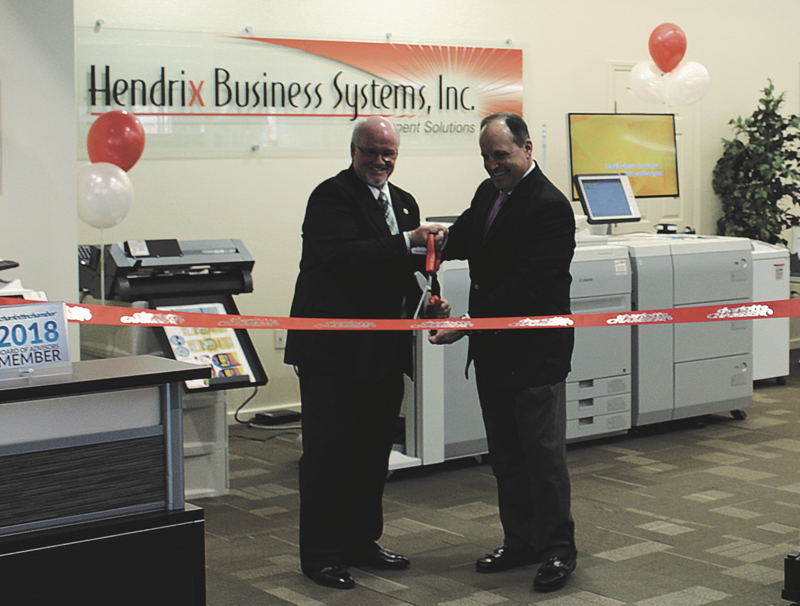 About Hendrix Business Systems, Inc.
Hendrix Business Systems, Inc. has been serving the Carolinas for over 40 years. As an Authorized Canon and Xerox Dealer, we provide document solutions for a variety of businesses throughout the Southeast region. Hendrix Business Systems provides faster sales and service response than our competitors through a Service-Centric approach and an elevated Customer Service experience. They have four interactive showrooms located in Matthews, Charlotte, Greensboro, and Raleigh, North Carolina where the latest Canon and Xerox office systems and solutions can be demonstrated by Hendrix professionals upon appointment. This entry was posted in Canon and tagged canon, Hendrix by andyslawetsky. Bookmark the permalink.